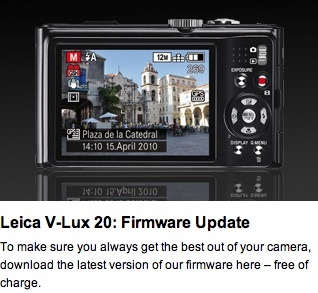 To download the latest firmware v2.0 for Leica V-Lux 20, you will have to login to the Leica Owners’ area. [MODE PLAY] has been added to the [PLAYBACK MODE]. This playback mode is useful if you wish to play back only still pictures or only videos. It is now possible to capture still pictures from motion pictures. Save a scene from a motion picture as a still picture. After the M8 firmware update, the Image Shuttle software update and now the V-Lux 20 firmware update, the only one left is the rumored M9 firmware update. Maybe next week? This entry was posted in Leica Compacts, Leica V-Lux and tagged Leica firmware. Bookmark the permalink. Trackbacks are closed, but you can post a comment.